Few steps from the Colosseum we can find one of the most important Basilicas of Rome: St. Clement. Visiting the basilica with its underground levels we understand why so often Rome is also called “The Eternal City”: different periods, styles and histories pass cross each other and overlap, in an endless historical development. The earlier church dedicated to St. Clement (nowadays completely underground) was built during the second half of the 4th Century A.D. on the foundations of an aristocratic house, a domus, belonging to the 3rd Century A.D. The domus was erected on its time on the foundations of a previous building made of tufa blocks covered by travertine blocks. This last building is separated by a narrow path (only 80 cm. 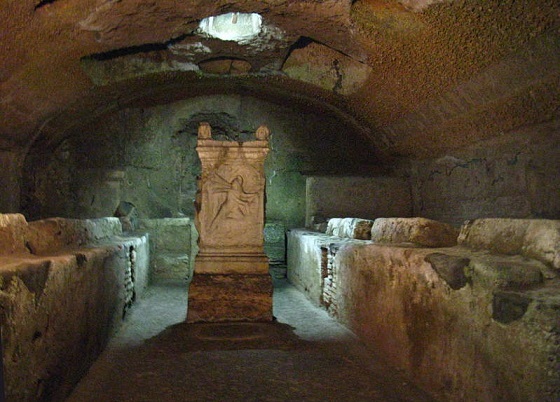 wide) from an insula, in which at the beginning of the 3rd Century a Mithraeum was placed. The earlier church was discovered in 1857; like the medieval one it has 3 naves divided by rows of columns, with a central apse located in the west side of the nave and a front side preceded by a portico near the main entrance. The flooring of the upper basilica corresponds exactly to the height of the capitals in the lower basilica. 1) Roman building under the ancient basilica, made of tufa blocks and covered by travertine slabs, dated at the end of the I century A.D.
3) New building made by the Christians on the tufa block structure at the beginning of the III century A.D.
4) Medieval Church on the early Christian basilica, made by Pope Pasquale II after the previous church was destroyed by the Normans in 1084.